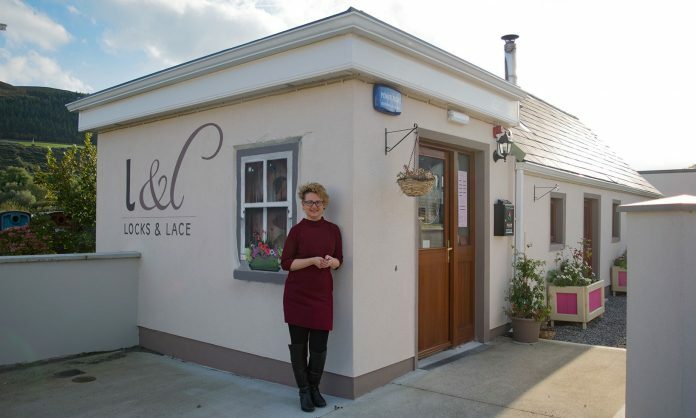 Emma Murphy opened Sligo’s first eco-certified organic hair and millinery studio, Locks & Lace, in Strandhill last year. Emma has over 20 years experience of working in the hairdressing industry and she is also a talented milliner, or in other words – a hat designer extraordinaire. Emma and her team offers a unique service, combining the best in organic hair colour and organic plant-based products hair &amp; skin care range. Locks &amp; Lace has proved popular since opening last October – not only will you get the healthiest hair on the west coast you will also be gaining the whole aromatherapy experience from the use of Natulique Eco certified organic hair colour range – organic, plant-based Intelligent-nutrients hair &amp; skin care range. Let Emma create a beautiful, bespoke, custom made hat to go perfectly with any outfit for that special occasion. With this bespoke millinery service, she can create a one-off hat within four weeks for any event. Emma’s hats are handcrafted and hand stitched to the highest of standards and created with the highest quality of sourced materials. Alternatively, choose from Emma’s wide range of ready to wear or rental pieces. All of Emma’s hats are priced individually, with orders coming in from all over the North West and beyond as she also sends her one-off pieces to customers abroad. She also offers a wide range of services and bridal packages in the salon or out on location. But it doesn’t stop there, while you relax and enjoy our freshly ground organic coffee, or our carefully sourced organic herbal teas, along with a healthy locally made treats – the perfect pamper palace. Emma and her team pride themselves on their healthy, holistic approach to hair without cutting corners on quality or creativity. Be pampered from the moment you walk into the calm environment, relaxed in their vintage inspired studio. The Locks &amp; Lace team offer a vast range of cutting edge services to make sure your experience is second to none. Locks & Lace are highly trained in their Zao Ecco certified organic retail makeup range. Zao is a bamboo &amp; silica based natural makeup line witch is new to the Irish shores and first to hit Locks & Lace. There is an array of makeup to suit every skin tone, all the products come in bamboo casing and refillable making this product even greater with its sustainability. You can also mix and match your own large or small palettes, weather your looking for a contour kit or smakey eye selection the choice is yours. Along with this incredible makeup line they are proud to have Ali Gordon MUA under their umbrella. Ali is an extremely talented makeup artist and is ready to make you look an feel amazing for any event. Also you will be able to avail of a nail polish or French manicure service with our five new chemical free Nail Berry. File and polish service is also only €10 on top of your final bill. A voucher from Locks &amp; Lace could be the perfect present for your loved one this year, with a bespoke hat, a brand new hair do or complete makeover. Contact Locks & Lace Organic unisex Hair, Makeup & Millinery Studio at 071-9128160 or find Locksandlace.com.